Was Hurricane Sandy supersized by climate change? As I write this, Hurricane Sandy’s minimum central pressure has dropped to a stunning 940 millibars, meaning that air is rising in this storm in a way similar to a Category 4 hurricane. Sandy is strengthening as it approaches an East Coast landfall tonight—even as the storm also undergoes a much-discussed “extratropical” transition from a hurricane into a winter cyclone. In the next 48 hours, we are going to find out the difference between just bad and the worst-case scenario. One thing, though, seems likely: This will be perceived as a climate-change-related event by much of the public. Weird, extreme weather makes people worry, makes them think the world is changing. They aren’t wrong about that. 2. Storm surge: Something similar can be said for Sandy’s storm surge, which will cause damage across a large area of the northeastern US coast and threatens to flood the New York City subway system. There’s no doubt that global warming has raised the sea level, meaning that every hurricane—including Sandy—surfs atop a higher ocean and can penetrate further inland. Indeed, this is true virtually by definition. 3. Ocean temperatures: As meteorologist Angela Fritz observes, sea surface temperatures off the Mid-Atlantic coast were near a record high in September, and 2.3 degrees Fahrenheit above the long term average. In fact, averaged across the globe, ocean temperatures in September were the second highest on record, surpassed only by 2003—and with much of the excess heat occurring in the Atlantic region. Warm oceans are jet fuel for hurricanes, so it’s fair to say that these warmer temperatures are revving Sandy’s engine. And while many factors shape sea surface temperatures in a given place, the overall trend—directly linked to climate change—is toward hotter oceans. Thus, while Sandy’s particular path could be considered a matter of chance, the warm temperatures beneath it allows the storm to be stronger, for longer, than it might otherwise have been. And global warming is creating a world where, on average, those warm temperatures will be there more often than they were in the past. Caveats notwithstanding, then, when people worry about climate change in relation to Sandy—and wonder why their presidential candidates aren’t bringing the matter up—it’s hard to say they’re misguided in doing so. In a campaign season that has studiously avoided the “C” word, Sandy reminds us that eventually, the weather always forces the issue. 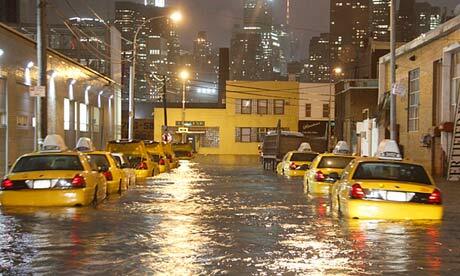 Super-storm Sandy raises more issues about nuclear power, the internet and also about global warming. As the storm struck the New Jersey coast and flooded New York City, three nuclear rectors were shut down because of problems with high water levels and electricity. Another reactor went on standby “alert” because its water intake levels were abnormally high. The reactors were Salem Unit 1 owned by utility PSEG on the Delaware River in New Jersey and Nine Mile Point 1 and Indian Point in New York. Another reactor, Oyster Creek in New Jersey, went on alert because of high water. This raises questions about how nuclear power stations can respond to natural events. Dominion’s North Anna units “tripped” and shut down after a rare earthquake a year ago in August. The station was down for three months. Also, according to the Union of Concerned Scientists, the Nuclear Regulatory Commission surveyed all U.S. reactors after an earthquake and tidal wave swamped the Fukushima power station in Japan in March 2011, causing the worst nuclear disaster since Chernobyl in 1986. The NRC found that hardly any of the U.S. reactors were built to withstand what was the maximum flood level on the site at the time they were built. That, unfortunately, is making things different. Climate change caused by man-made pollution is melting icecaps and raising ocean levels. It is also creating warmer ocean waters and breeding more powerful storms. The combination spells danger for aging nuclear reactors. Hurricane Sandy was an extremely late season storm and was fed on 70 degree ocean water that seems to have been farther north than usual for late October. The strong possibility is that this is part of the climate change package since most hurricanes along the U.S. East Coast tend to die off after early October although the hurricane season technically runs until Nov. 30. Downed reactors is just another technology problem. Flooding and power outages in New York affected the World Wide Web and some sites, such as Huffington Post, went blank for hours. In Richmond, for instance, independent radio WRIR could not stream its broadcasts because of the New York problems. These problems are real and cannot be explained away in their usual way by climate change doubters. We really don’t have the time anymore to indulge their fantasies. ATHENS, GEORGIA – In the waning weeks of the North American hurricane season – a time when a superstorm is not expected to cause widespread damage to the eastern coast of the United States – Hurricane Sandy is a grim reminder of the menace of extreme weather events. With the lowest central pressure of the 2012 hurricane season, Sandy may have caused up to $20 billion in damages, making it one of the costliest superstorms in history. Sandy interacted with a weather system moving toward it from the east, posing difficult challenges for forecasters and nearly unprecedented weather conditions for the region. A similar storm hit New England 20 years ago. But Sandy was worse, delivering hurricane-strength winds, drenching rains, and severe coastal flooding throughout the populous mid-Atlantic and northeast corridor. Some people will, of course, try to link Sandy with climate change. A similar rush to judgment occurred in the wake of massive tornado outbreaks in the US in recent years, even though the scientific literature does not offer strong support for such a connection. So, from the perspective of climate change, it is best to take a measured view of Sandy, lest hasty reaction harm scientific credibility. But that is little cause for comfort. According to the giant insurance company Munich Re, weather and climate disasters contributed to more than one-third of a trillion dollars in damage worldwide in 2011, and this year’s total may rival that amount. There is growing evidence of links between climate change and sea-level rise, heat waves, droughts, and rainfall intensity, and, although scientific research on hurricanes and tornadoes is not as conclusive, that may be changing. Indeed, recent reports by the United Nations’ Intergovernmental Panel on Climate Change (IPCC) and other scientific literature suggest that the intensity of tropical cyclones (that is, hurricanes) will increase as a result of warmer waters. And our atmosphere and oceans are, indeed, warming, with substantial residual heat stored in the ocean, to be released at some future time. A few studies have even suggested that tropical cyclones may be “wetter.” It is quite certain that sea levels have risen over the last century, and continue to rise, in response to changing climate. And storm surges now ride on these elevated sea levels, amplifying flooding losses where they strike. Sea surface temperatures along the US northeast coast are about five degrees Fahrenheit above average, which helped to intensify Sandy just prior to landfall. At this point, it is premature to link the storm’s severity to warmer sea-surface temperatures, because regional variability is known to occur. But the link certainly is plausible. Moreover, sea levels along the US northeast coast are rising up to four times faster than the global average, making the region more vulnerable to storm surges and flooding. And here the bottom line is that any coastal storm system will produce more flooding because of sea level rise. It should also be noted that an atmospheric weather pattern known as a “block,” a persistent area of high pressure that may have led to record melting in Greenland, was most likely the reason that Sandy moved inland rather than out to sea. It is too early to tell whether this blocking pattern is a manifestation of weather variability, a short-term climate variation, or the result of climate change. Advances in numerical weather forecasting during the past several decades have extended our ability to “see” into the future. In September 1938, before all of these advances, a hurricane devastated much of New England. No warnings were issued prior to its arrival. Today, thanks to satellites, weather balloons, supercomputers, and skilled forecasters, we can anticipate hazardous weather up to a week in advance. Similar advances in climate modeling are occurring, thanks to methodological improvements and better data. At a minimum, we must ensure that world-class weather and climate-modeling centers have the necessary funding and manpower to implement the most advanced forecasting techniques. Numerical weather forecasting was invented in the US, but today other countries have developed extremely high modeling capacity. For example, the European Center for Medium-Range Weather Forecasts, in Great Britain, was targeting an East Coast landfall for Sandy days ahead of the best American model. The world will need more cooperation in the coming years, as climate change begins to interact with and exacerbate extreme weather events, in order to gain the lead-time needed to prepare for disasters. We will also need the collaboration among governments, the private sector, and academia that often leads to improvements in forecasting. Scientific meetings are key forums for sharing research, vetting new methodologies, and forging new partnerships. Many occur on an international basis, and we need to encourage such discourse, even in tough times for government budgets. It is reasonable to ask how well we would be able to predict or assess a storm like Sandy without the knowledge and capacity gained through such international collaboration. We do not know whether superstorms like Sandy are harbingers of a “new normal” in the uneasy and unpredictable relationship between climate change and extreme weather events. That does not mean that there is not or cannot be such a connection, but rather that the scientific research needed to prove (or disprove) it must still be conducted. That is how good science works. Sandy has provided a powerful demonstration of the need to support it. Will Obama and Romney see climate change in Hurricane Sandy? Hurricane Sandy‘s devastating intrusion into the final days of the presidential race would have at least one positive result if it inspired President Obama and Mitt Romney to finally address a huge issue they have ignored throughout the long campaign: climate change. After the firestorms that swept the West amid a merciless drought and the killer tornadoes and freak storms that battered the Midwest, South and East Coast, Sandy is just 2012’s latest screaming reminder that our weather is becoming a much more destructive force. Sandy is an example of a weather phenomenon we have not seen before — a confluence of hurricane, cold air and an altered jet stream that created a monster storm stretching from the Caribbean to Canada and from the Atlantic to Chicago. While the rest of the world long ago moved beyond asking if climate change is real to accepting it as a fact, the United States has stalled in a ridiculous debate. Romney leads a party in which a majority believes that climate change is a hoax and the rest — including Romney — avoid talking about the issue, lest they be seen as anti-capitalist, bug-loving granola eaters. Obama could speak to the issue if he wished, but he avoids it too, perhaps not wanting to give the right-wingers another reason to accuse him of plotting against America. The issue cannot be skirted forever, though. Members of Congress can rant on about hoaxes and nefarious plots to destroy industry by curtailing CO2 emissions, but one day not too distant, even the science deniers will be unable to deny that a big bill is coming due. Rising sea levels, extended drought, raging wildfires and more frequent and more violent storms will have a huge economic cost. Already, insurance companies are eyeing the exits, thinking that selling policies to cover natural disasters has become a very bad bet. When the insurance industry bails, government will have to pick up the expense of taking care of people who have been pummeled by weather and have lost homes, businesses and livelihoods as a result. Cities and states face a big job ahead, dealing with floods, fires, shifting shorelines and paying for the manpower and infrastructure necessary to deal with those challenges. American agriculture will need to be revamped as farming and grazing land turns to dust in the heart of the country. It is way past time for the federal government to develop a comprehensive plan for dealing with all of this. And it is truly unconscionable that our presidential candidates have ignored the issue, other than to spout a few gaseous sound bites about clean energy and green jobs. To twist an old passage from the Bible, they that sow only hot air shall reap the whirlwind. ~ by FSVSF Admin on 31 October, 2012.